There’s a parody trailer for Bulletstorm that was put on Youtube in the runup to the game’s release. In it, the developers (People Can Fly) mercilessly savage the staid, sterile, formulaic tropes present in the Call of Duty series and its imitators: linear levels, identikit enemies, identikit weapons, being told to go here and do this, people who are on your side dying tragically, slow motion sequences in which you take out a particularly heinous enemy, the whole works. 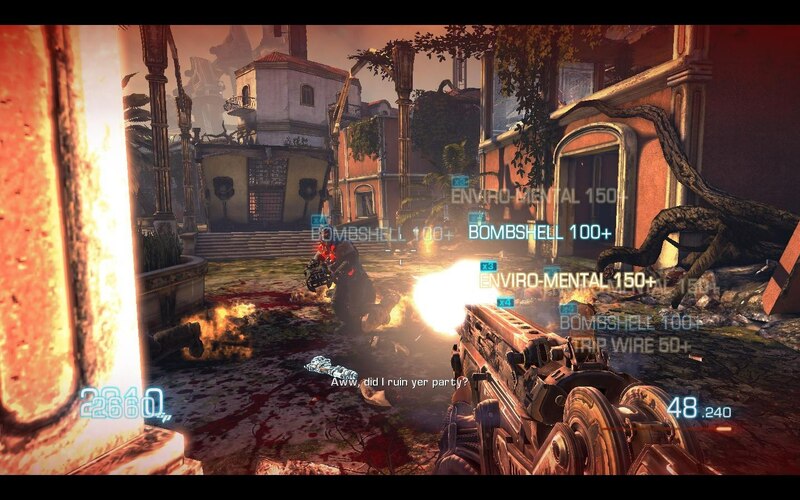 At the time People Can Fly were trying to promote Bulletstorm as a “Fun” Person Shooter, where the priority was given to making a bright, colourful game for the player to enjoy rather than another dull military shooter set in brownland. Bulletstorm was supposed to be more in keeping with the Serious Sam/(old) Duke Nukem games; an over-the-top shooter experience where you’re given a bunch of ludicrously overpowered weapons and told to go to town on the enemy. Which is why, having finally played it now, I’m a little surprised to discover that Bulletstorm falls into many of the stock FPS cliches it so consciously mocked in the marketing.